Cross The Line writer, Ollie Baines met up with Chelsea legend and 1954-1955 Championship winner, Derek Saunders. I’ve lived in Frinton-on-sea for quite a while now, I moved here in 1999 and little did I know that living next door was a true footballing great. Derek Saunders, the former England Amateur captain and Chelsea Division One winner in that infamous 1954-1955 season was right on my doorstep. So, as any football fan would, I asked Derek if we could have a chat a remember those glory days. “I got into football at school, that’s where it all began. In those days, at the beginning of the war, all the young masters were called up to serve and only the men did the football. Because I was quite good, I was asked, much to my dis-belief, to take the football teams; I took my class and all the others. It did mean I missed all my other lessons though! What happened after you said no to the London club? What were you like as a captain? How did you come to sign for Chelsea? What was it like to play in the Helsinki Olympics? What position did you play at Chelsea? You didn’t score many goals in your career but when you did score, it was a cracker. Can you remember any in particular? You were part of the Division One winning side at Chelsea, what was that like to win the league? At Chelsea, were there any stand out players? Do you still follow Chelsea? “Yes, I still follow them and see how they do. In recent years, I’ve been to the stadium to celebrate our 50th year anniversary of when we won the league and it was great to see my old team-mates”. 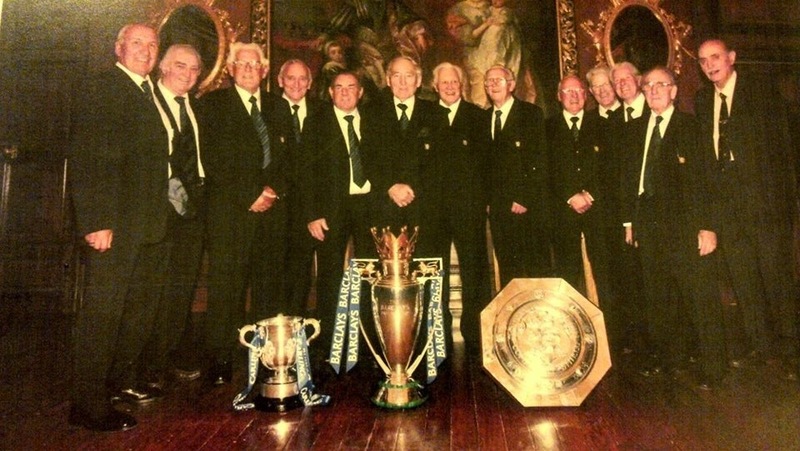 Derek Saunders pictured 6 from the right, standing behind the Shield. If you had the choice, would you play football in today’s game? Being a footballer, would you consider yourself as famous? So after you left Chelsea, what happned? What was your stand-out moment in your career? An incredible career from an incredible player. It was a privilege to speak to Derek and re-live his career. Capped off with a signed photo of himself in his playing days. Share this rare interview with Derek today!